Kevin was a true professional who loved his job and lived life to the full. He gave 19 loyal years to the Army and will be sadly missed by his Wife, Mother, Family and friends. Colour Serjeant Fortuna was an utterly professional commander, Rifleman and a man of irreproachable integrity. His presence strengthened the Battalion and the loss with his passing will be acute. He was remarkable for many reasons, not least his complete and unwavering commitment to his Riflemen and their care. He was restless until he had achieved the very best for them and encouraged them to be restless until they achieved the very best for themselves. He was a master-tactician, and a soldier of great experience. He was to be a Company Serjeant Major in just three months time. Tonight I saw the impact of his passing on his tight-knit Multiple, brought together under his leadership over the last 8 months of hard training and latterly operations. Their grief-stricken resolve to get back out and continue the work that Colour Serjeant Fortuna had set in motion was awe-inspiring. It is a testament to his legacy, which will, forever, bond that band of Riflemen together. I will never forget him and nor will 1 RIFLES. I relied often on his considered and impeccable judgement. And on his humour and sense of fun. His name joins the list of Rifles’ heroes from which we will always draw inspiration and courage. At this impossibly difficult time our prayers and thoughts rest with his wife, Nia, and his Mother Sue and Brother Kris. Colour Serjeant Fortuna was the finest of Riflemen and a good friend. His energy and enthusiasm for life were infectious and endless, his modesty humbling, and his resourcefulness inspiring. His core inner strength and confidence enabled an air of invulnerability; nothing was too much for him in both caring and understanding the needs of his Riflemen and ensuring mission success. But whether for his beloved wife Nia or for his fellow Riflemen, his first priority was to care for others. He was easy going, relaxed, yet hard working and professional, and had a waterproof smile that kept others going when things got tough. His wife and friends were all proud of him, as were we, his Brothers in Arms in Afghanistan. Our thoughts here are now with all those who knew him at this unimaginably awful time; we will not forget our Brother. I liked Colour Serjeant Fortuna instantly, as did everyone who met him. A towering individual he was an unassuming, proud and professional Rifleman who displayed all the qualities one would expect from someone about to be promoted to Warrant Officer: determination, unselfishness, courage, leadership and cheerfulness in adversity. This ethos was recognised and shared by the Royal Marines Commando colleagues with whom he lived and fought side by side. It was obvious his men were devoted to him and that there was a special bond between them; a strong identity that comes from being a small group of Rifleman operating in an isolated check point. This loss will be felt so deeply by Riflemen and Royal Marines alike. Colour Serjeant Fortuna was killed by an insurgent Improvised Explosive Device whilst leading his men; a cynical and cowardly mechanism of death that is unbecoming a man of his courage and stature. 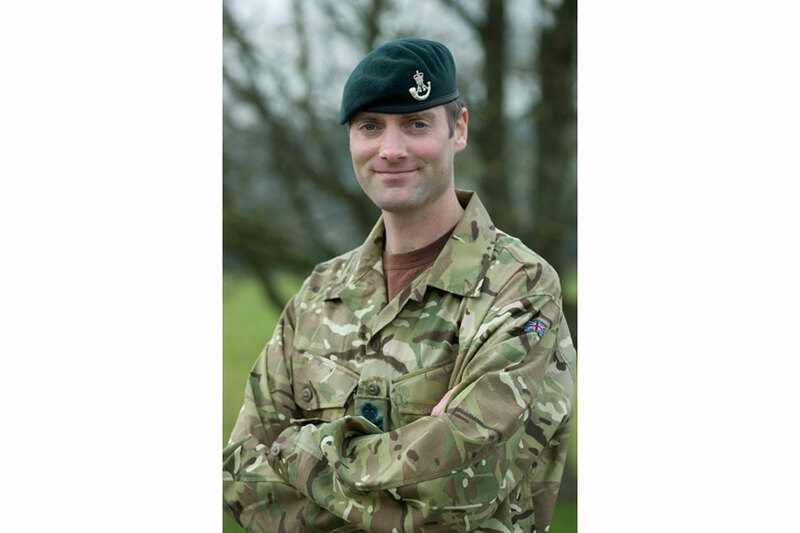 He will be missed by the ‘Black Knights’ of Kilo Company, 42 Commando Royal Marines and our thoughts are with his family, friends and the men he led and leaves behind. Colour Serjeant Fortuna was simply a pleasure to know. He was everything that I could ask for in a Senior Non-Commissioned Officer, and so much more. He was an utterly committed Rifleman, who had excelled himself time and again tactically in the field, as an instructor in the classroom and as a highly intelligent thinking member of my Command Group. Colour Serjeant Fortuna’s potential shone bright, and he was shortly to take over as my Company Serjeant Major on promotion. Despite this huge talent, Colour Serjeant Fortuna’s most inspiring quality was his quiet humility, which was the mark of the man. Gentle by nature, Colour Serjeant Fortuna cared deeply for each and every one of his Riflemen, in whom he invested so much of his time with both professional and personal interest. Colour Serjeant Fortuna’s meticulous knowledge of his profession and his Riflemen made him an outstanding Platoon Commander who was much respected by all who served with him. I have no doubt that I, and many others, are better Riflemen for having known this extraordinary man. His tragic death, leading his men in the line of duty, is a loss to the Company of a fine future Company Serjeant Major. It has robbed The Rifles and its Riflemen of a friend and an exemplary role model. Our dearest thoughts are with Colour Serjeant Fortuna’s wife and family. I knew Colour Serjeant Kev Fortuna well, having served with him on and off for more than a decade. He was once my Second-in-Command on Exercise CAMBRIAN PATROL, a tough patrols exercise in the Brecon Beacons. He came late to the team and shone, despite having missed a month’s dedicated training. Such was the quality of this exceptional man. Last year I had the privilege of commanding Support Company, 1 RIFLES, with Colour Serjeant Fortuna as my Machine Gun Platoon Commander. Despite not coming from the Machine Gun world, he threw himself into the job with characteristic zeal, enthusiasm and ability. While attending the Machine Gun Platoon Commanders’ Course he would steal into the office of a weekend to update me on his thoughts on how best the Battalion could employ Machine Guns in line with developing Fire Support Group doctrine. One of the most intelligent men in the Battle Group, he was a real thinker, brimming with good ideas. He also gave my other Platoon Commanders - Captains - a run for their money when it came to personnel administration and report writing, always going the extra mile to do the best by his treasured Riflemen. Kev was one of the best and we will miss him terribly - not least Support Company where he was shortly due to take over as Company Serjeant Major - but our thoughts and prayers are of course with his beloved wife and family. We’ll do his memory proud. Kev epitomised exactly what a Rifleman should aspire to be like: a calming influence on his fellow Riflemen who led them with the diligence, professionalism, love and humour; qualities that we all had learned to expect from Kev. In the Mess, Kev was a great source of fun, and this is where his dryness and quick-witted one liners were a constant source of entertainment that we will all miss dearly. Kev ‘4fish’ Fortuna was a friend of more years than I remember. When you think of words like leader, inspiration, professional, they don’t do him justice; Kev was one of the very, very best. All those that served alongside him will speak with nothing but admiration for him. There are no words that will ever describe just how good he was. My thoughts go out to his multiple, my prayers and deepest sympathies go to his loving wife Nia, and the rest of Kev’s family. God bless, rest in peace. Swift and Bold. Kev Fortuna, a strong, fit, intelligent man with a very bright future, Kev always greeted you with a smile and intellectual conversation. His immaculate administration and attention to detail are just a couple of attributes that made him an outstanding soldier, a total professional and a good friend. He will be sorely missed by all that knew him. I first had the pleasure of meeting Kev (the Meerkat) when we were both posted to Lydd as instructors. We got on very well, and I soon learned he was a highly professional, diligent, kind and helpful person. His skills and talents far surpassed a lot of other great soldiers I have known over the years, and he would always be there for you if you ever required a hand with anything. Kev Fortuna was a dear friend who will be greatly missed. Kev took over as our Multiple Commander at the beginning of pre-tour training. Kev was experienced, mainly in the support role as the Machine Gun Platoon Commander, which he enjoyed very dearly. What Kev had brought to the party was 19 years of experience, having done operational tours with the Royal Gloucester, Berkshire and Wiltshire Regiment, 2 RIFLES, 5 RIFLES, and 1 RIFLES. During the pre-deployment training and numerous exercises leading up to this Afghanistan Tour, Kev didn’t believe in wearing any warm kit, but when back in camp in Chepstow he always seemed to be wearing his Softy Jacket. Inside the Check Point - anything that needed doing or fixing - Kev was all over any job and task. He didn’t believe in wasting Tax payers’ time. Kev met his wife Nia in Colchester and was married for a number of years. His obsession was his BMW Z4 and Meerkats, of which they had adopted a few. He was a very experienced commander and an inspiration to us all. Kev would always set the standards and the professionalism that goes with this. Kev never once cut corners and every Rifleman would always look up to him, willing to fight side by side with such an inspirational commander, a leader of all men. His command ability was second to none, and he would stay until the mission had been completed. Kev Fortuna will be sorely missed by all who knew him. 20 years of friendly banter, jolly boys outings and surf trips. Kev was always a loyal, honourable and trustworthy leader and friend, even when I broke his jeep in Cyprus. You will be missed - my deepest sympathies go to Nia. In the time CSjt Fortuna was Officer Commanding the Machine Gun Platoon, the effort and dedication he put into the platoon was more than any other platoon commander before him. His diligence, attention to detail and thorough knowledge of all military matters was second to none. It wasn’t unknown for the Riflemen to refer to Kev as ‘The Laser’ but I have never known a platoon run so well. Whenever I needed advice, work related or personal, he would always be my first port of call; he would always make five minutes for you and a brew. I was proud to call him my boss and my friend. I was greatly saddened to hear of the death of Colour Serjeant Kevin Fortuna in Afghanistan. He was an exceptional soldier with significant operational experience, and his loss will be keenly felt by his close-knit unit. He cared passionately for those under his command and was highly respected and popular throughout the Battalion. My thoughts are with his family and friends at this difficult time. The spelling of Serjeant with a “j” is a military tradition peculiar to The Rifles.